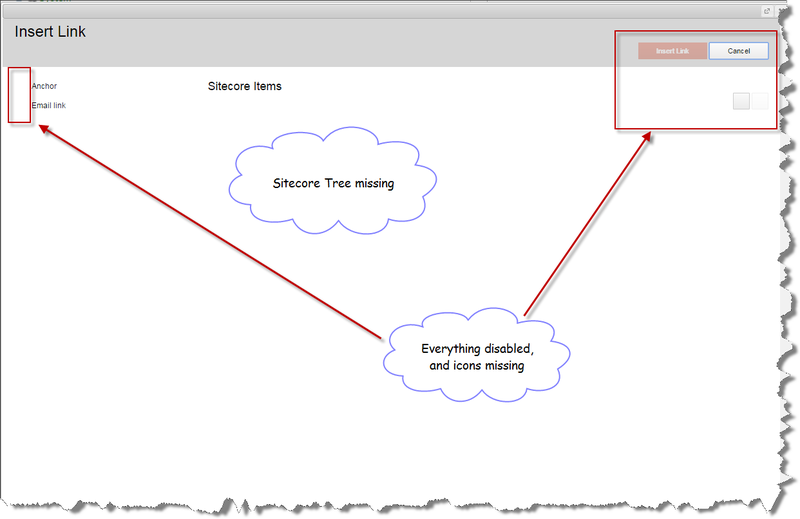 Sitecore SPEAK Insert Link Dialog – missing icons & sitecore tree – Don’t panic, U didn’t break it!!!! I was upgrading a solution from 6.2 to 7.2 and it had a number of custom fields that no longer worked, so I started to fix the code. Whist starting to panic, after 5 minutes I noticed that the dialog had fixed itself!!!! It appears that after a restart of the website the first time you open the “Insert link” dialog you have to wait 5 minutes for it to start working, after that it works straight away. This entry was posted in .Net, Sitecore, Sitecore 7.5, SPEAK and tagged Dialog, Missing icons, Sitecore, Sitecore 7.5, SPEAK, tree control on April 23, 2015 by Alan Coates.